For those seeking a sumptuous and relaxing holiday base within easy reach of amenities will find Villa Magenta an excellent choice. For those seeking a sumptuous and relaxing holiday base within easy reach of amenities will find Villa Magenta an excellent choice. 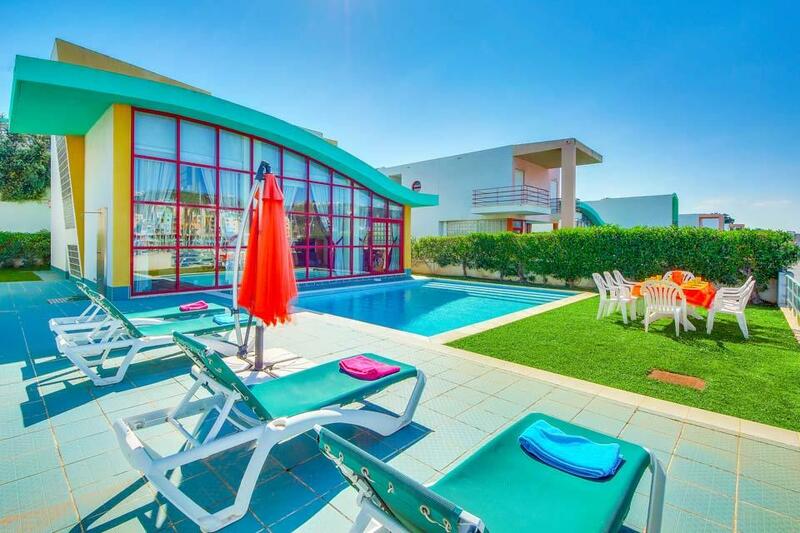 Situated in the popular and picturesque seaside resort of Albufeira, Villa Magenta could not be better located. This beautifully constructed modern villa boasts four air conditioned en-suite bedrooms, all of which are decorated in a lovely contemporary fashion, along with a large fully equipped kitchen and a delightfully decorated spacious open plan living room/dining room with patio doors opening onto a large sun terrace. The private gardens are surrounded by mature plants and a fabulous private swimming pool and attractive outdoor lounge furniture, perfect for morning coffees and evening sundowners alike! Albufeiras family friendly beaches are a short drive away and are renowned for their clean waters and extensive water sports facilities, or alternatively, why not enjoy a gentle hour or two snorkelling around the shallow waters or simply lazing around in the sun! 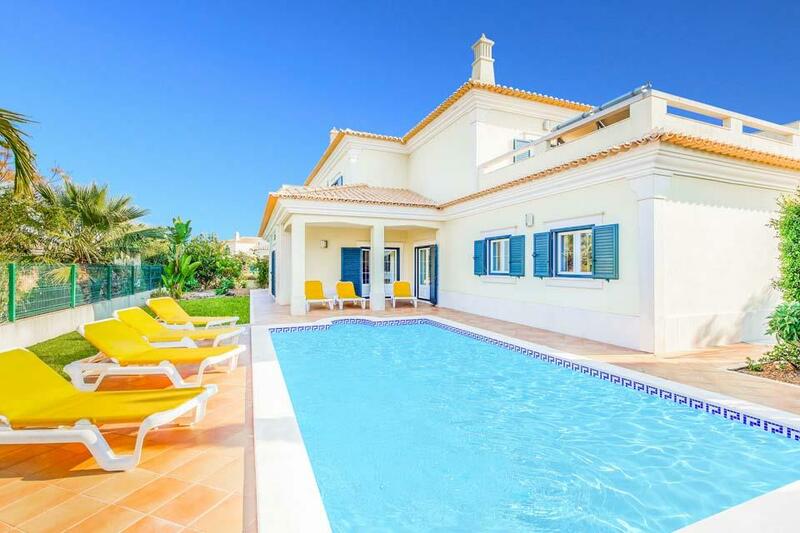 There is also an extensive selection of shops, cafés and restaurants within an easy ten minute walk from this highly desirable villa, and with the equally appealing resorts of Vilamoura and Gale less than a 15 minute drive away, it is clear that Villa Magenta is going to prove very popular amongst our clientele over the coming years. A great villa for a family holiday, quiet location, good facilities. Booked this 5 Day holiday at short notice on the advice of a friend. Villa was extremely spacious with its own pool and furnished and equipped to a high standard. Will definitely book again. Excellent service and support. Beautiful villa well equipped, close to bus stop, if you don't drive.....icing on the cake would have been more English channels on TV and music. No supermarket in easy walking distance, but close to three bar/restaurants. Villa was clean and very well equipped.Pool and garden were beautiful, but unfortunately there was no heating facility for the pool, so the kids didnt spend as much time in there as we would have expected them to, water was pretty cold.There were few amenities in the immediate area but a little further afield there was a beautiful beach and the old town was just fabulous with great bars and especially restaurants. All in all it was a memorable holiday and everybody had a great time, thank you so much. Excellent villa, with modern kitchen and nice furnishings. Lovely pool with terrace and bbq. Nice location away from the hustle and bustle but easy walk/taxi/tuktuk to town. Generally great location. The villa was better than expected, often pictures on websites can be misleading however, in this case I feel like they didn't do the villa justice. Villa Magenta was fabulous from arriving to leaving. The location was perfect for us, it was far enough away from the hustle and bustle but not not too far if you wanted to have a good night out. The villa had everything you could possibly need and more, it was clean and very spacious. The cleaners came to clean the villa on only our second day which was very impresive and they were extremely freindly. We will be looking to book a villa through Solmar villas in the near future. 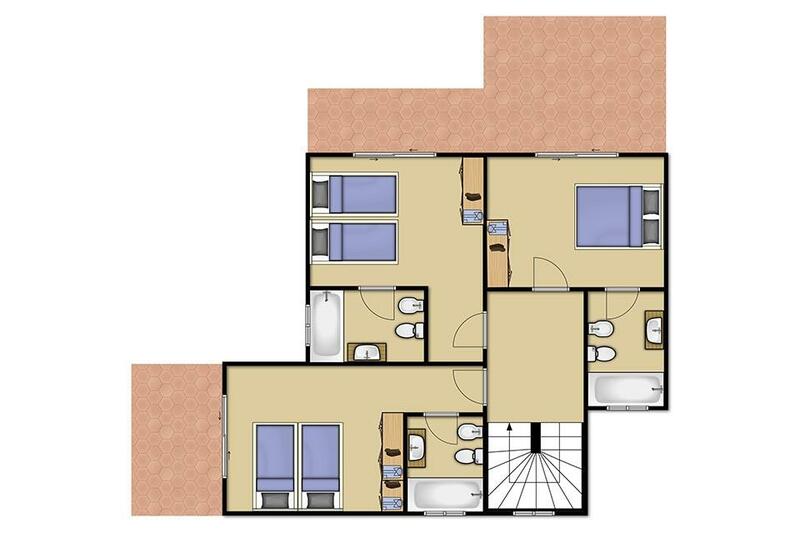 All mod cons, pleasant location, clean, nice resort. Villa was wonderful , offered everything we were looking for, quiet, spacious, clean, staff were helpful when required, a short drive from all amenities and beaches. 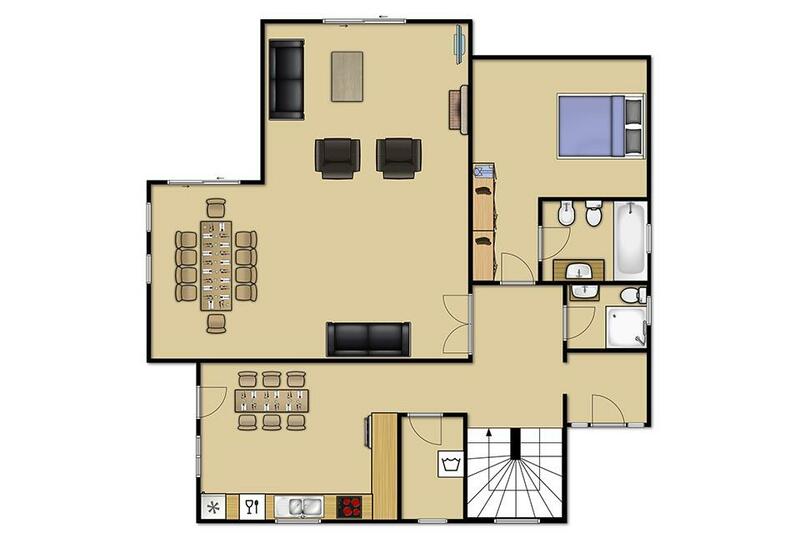 As described and seen on the web site, very clean and spacious. 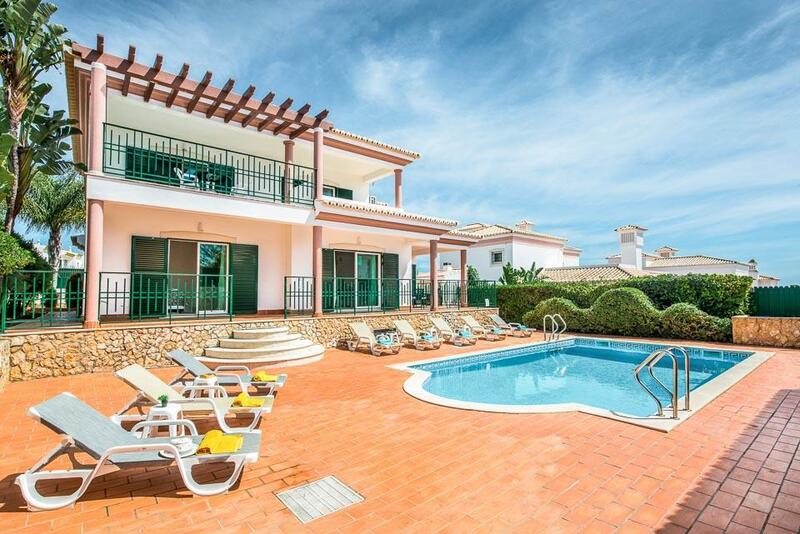 Villa Magenta is ideally located to explore both the old and new towns of Albuferia. The villa it itself is fantastic! The pool was great and really liked that all bedrooms were en-suite. The resort had plenty of places to choose between for dinner. Staff in bars/restaurants were excellent with children of all ages. The villa was fabulous.Couldn't fault anything about it.The pool was cleaned when we were there and the maid service was faultless.Easy access to Old Town and the strip.Have told all our friends great place to go. The villa was spacious, clean, good sized pool with plenty sun beds, modern well equipped kitchen, plenty of verandas, towels changed often, defects attended to quickly. Resort old town was very good and the strip interesting but could not go there every night. Good choice of eating places and supermarkets. 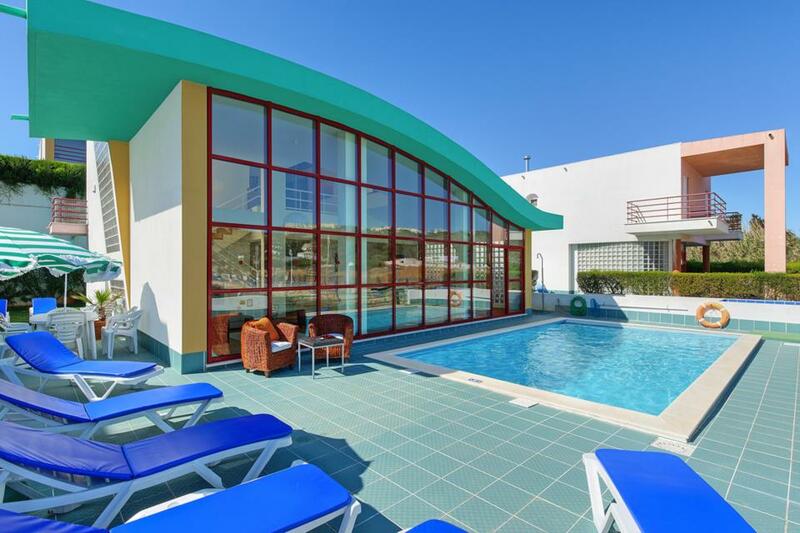 Offering beautiful views across Albufeira marina, Villa Marina Dos is located in an enviable position. The spacious and contemporary double height living space boasts floor to ceiling windows to make the most of the spectacular marina location and is..